The predicted coverage map below should only be used as a general guide. 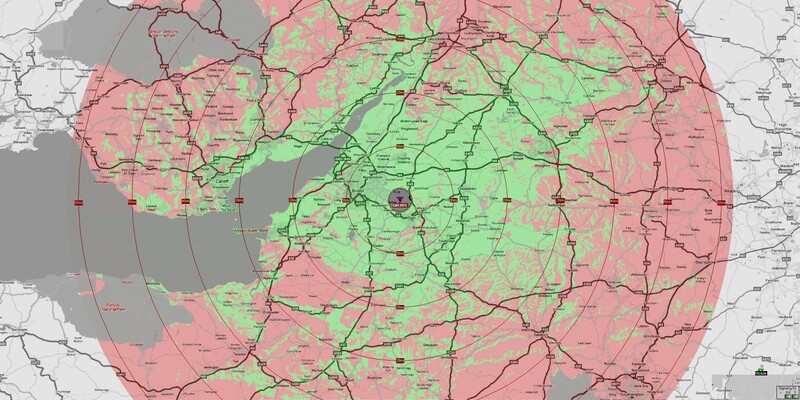 The map is generated by dedicated software that has been modelled around all the parameters of GB3BS and its Antenna System. For a more detailed picture you may download a higher resolution picture or use the Google Earth file that will automatically overlay the coverage map onto Google Earth, providing you have it installed. Download High Resolution JPG picture. Green: Signal level above 0.8uV. Red: Signal level below 0.8uV.